Continuing the Transformers III Silver Trio Series from the Perth Mint is the Transformers III - Bumblebee 1 oz. Silver Proof Coin. This strike is one of three Transformers Coins struck by the Perth to coincide with the pending release of the summer movie titled Transformers: Dark of the Moon. Like other coins in the series, each of these are struck from one ounce of 99.9% pure silver to proof quality. They feature a colorful reverse design showcasing one of the fictional characters of the Transformers franchise. In this case of this strike, the featured character is that of the Autobot known as Bumblebee. "Sent to Earth ahead of the other Autobots, Bumblebee served as both scout and protector of Sam Witwicky. Bumblebee is an expert at infiltration and observation, and what he lacks in size he more than makes up for in spark. Optimus Prime and the Autobots know they can always count on Bumblebee to fight for the heroic ideals of freedom and justice." 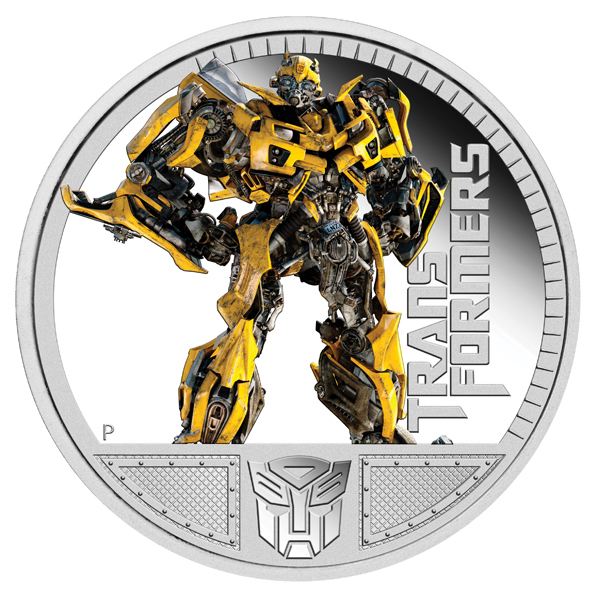 The Bumbleebee Silver Proof Coin joins the Optimus Prime Transformers Coin also released by the Perth as part of the series representing the Autobots, the heroes of the pending movie release. A third strike in the series depicts the Decepticon Megatron and together the three strikes make up the trio issued by the Perth for the new movie. They follow two Transformers Coins released two years ago when the blockbuster movie Transformers : Revenge of the Fallen opened. Those two coins (depicting Optimus Prime and Megatron) were extremely popular as buyers purchased them for their collections or to give as gifts. The Perth has placed a mintage cap of only 5,000 on the coins. Each will ship in a clear presentation case with an illustrated shipper and a numbered certificate of authenticity.